SAN FRANCISCO, April 16, 2018 – The San Francisco Arts Commission and Recreation and Park Department announce a new yearlong public art installation in Hayes Valley’s Patricia’s Green made possible with funding from developer impact fees. SQUARED is a 50-foot-tall tree “reimagined in a futuristic world post nature,” according to the artist Charles Gadeken. At night, the sculpture performs a light show of in an almost infinite array of color patterns, creating a different experience and ambiance from one minute to the next. Dedication event with live music scheduled for May 5, 2018, 6-9 p.m. at Patricia's Greeen. Previously exhibited at the Coachella Valley Music and Arts Festival and at Burning Man, SQUARED features 768 white plastic cubes arrayed in fractal clusters on a black steel square tube frame. Each cube holds 12-24 individually addressable LEDs, programed through custom software to generate millions of colors and thousands of patterns. A pre-set program directs waves of colors and patterns that sweep over the tree to create an ever-shifting kaleidoscope of light. The sculpture also has an interactive mode that can be accessed by a touchscreen to allow visitors to play with the artwork. In addition to the dedication event on May 5 from 6-7 p.m., the artist will host additional community events that will be announced via social media. The public can follow #squaredsf for updates or http://www.charlesgadeken.com/squaredsf. Charles Gadeken is a professional industrial artist working in the Bay Area for over 20 years. 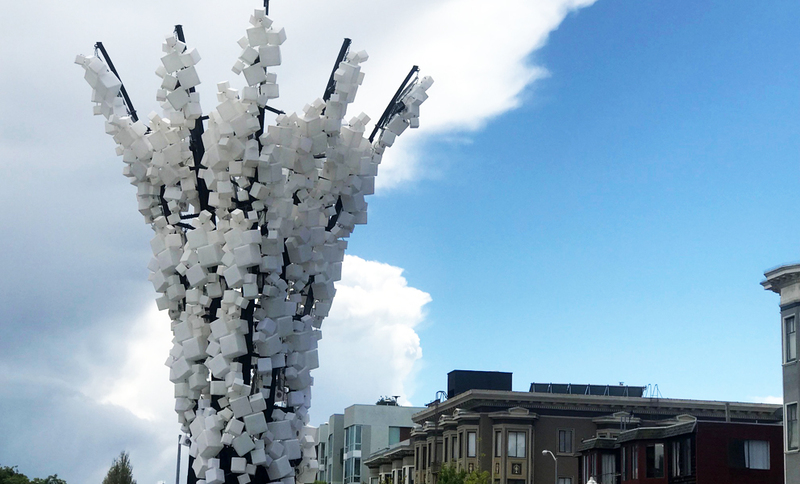 His monumental interactive public artworks, which include commissions by Black Rock Arts Foundation, Insomniac Events, Coachella, Absolut Vodka, and the City of Palo Alto, have been exhibited internationally. His artistic practice seeks to realize the potential for unexpected magic and serendipity in everyday life, depicting natural objects in a fantastic way. His goal through this work is to instill a sense of play into the environment, taking the form of things we tend to overlook and remaking them as magical items that exist as real life portals to our imagination.